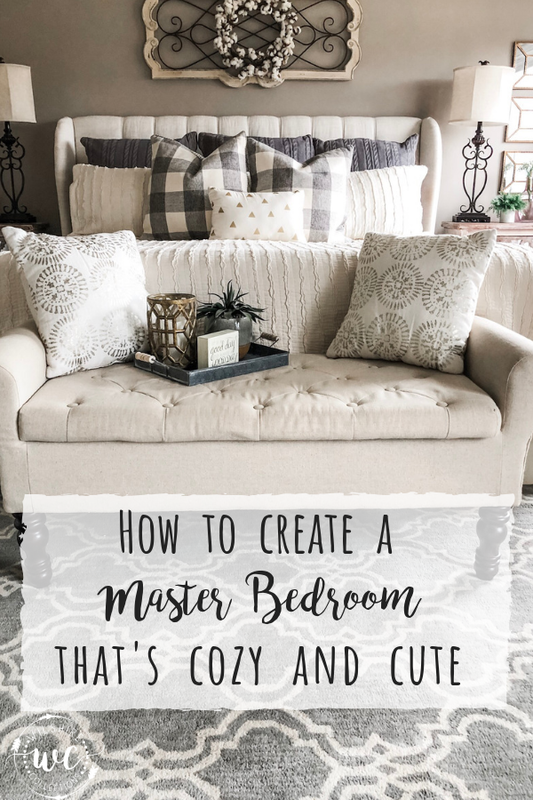 How to create a master bedroom that is cozy and cute! 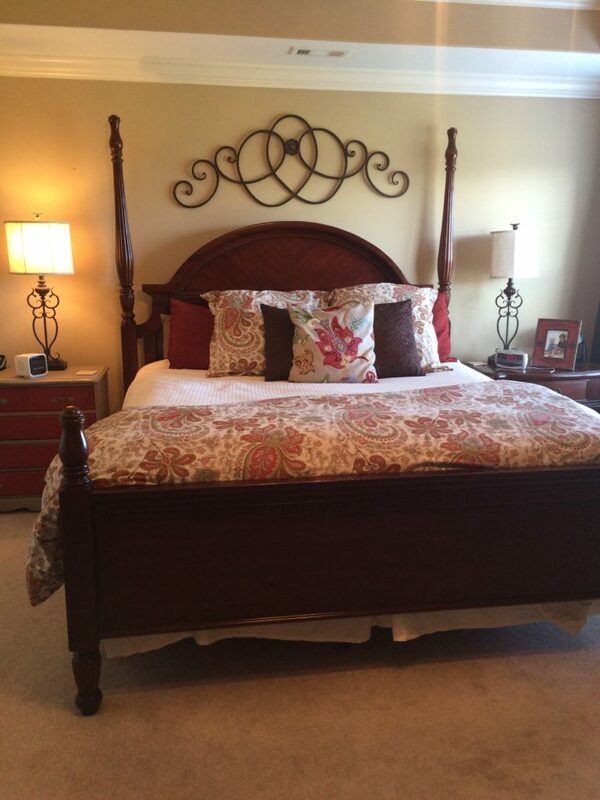 Does anyone else feel like sometimes the Master Bedroom is the LAST place to get attention when it comes to decorating? If you are like me, you close the door when people come over so they don’t see the mess! You do whatever you can just to keep that little gem hidden from the world. Haha! For YEARS in this house, our master bedroom was a mixture of stuff. I would buy new bedding thinking that would be “enough” and make me love it, and it just never was. It was never a spot I loved or wanted to spend time in, it was just a spot for sleeping. A few years ago, we decided our project would be our master bedroom and that we finally wanted to focus some time and budget there! Man oh man, I’m so glad we did! I truly love our room now. It feels more like a retreat at the end of a long day, rather than an eye sore. Today I’m sharing some tips on how to create a neutral and cozy master bedroom! One you can relax in, be proud of and enjoy! Paint! We had the room painted in Sherwin Williams Perfect Greige. Paint can make one of the biggest impacts when decorating! We got rid of the cherry headboard we had since we first got married and we got a linen upholstered headboard. You can find our exact one here. I lucked into 2 adorable matching nightstands at old time pottery! New bedding! I went for the super neutral look of ivory, because I knew I wanted to be able to change out my pillows for different seasons. It has worked perfectly! My exact bedding is no longer available, but you can find a couple of “dupes” here and here. Painted furniture! I painted the long dresser and the tall chest from Cherry and dark wood, to white and bright! That was a game changer and so much less expensive than replacing and buying new! 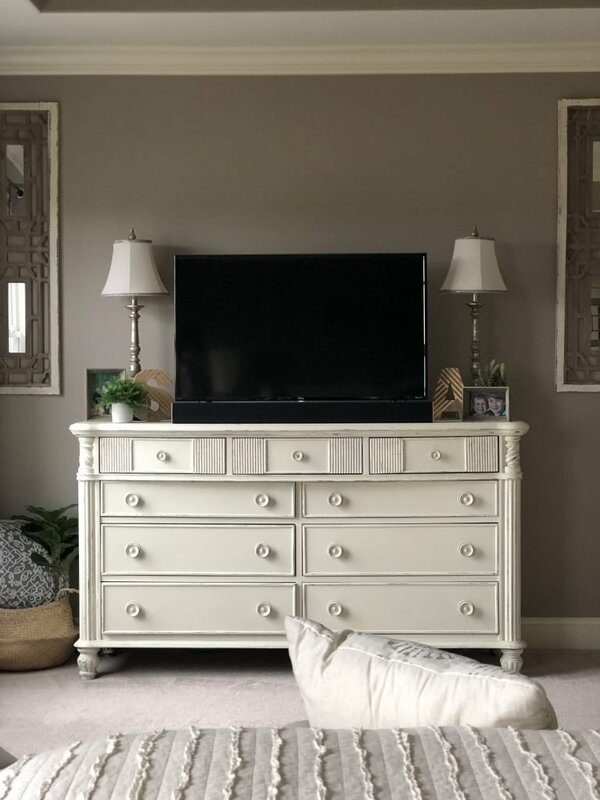 You can see the older post from where I painted the dresser here. Rug! Putting that larger rug under the bed was the perfect touch. It was a home goods find, but here are a couple of similar styles. Here and here! Little coordinating bench was a Marshall’s find and went so good with the headboard. Here are a couple of cute ones I found online! Here and here! Craigslist find chair to create a cozy little area for sitting. If you have space- ALWAYS add a chair (or 2) to your room! I just ordered this BUFFALO CHECK chair in gray! I will either put it in here or down in the living room. Haven’t decided yet! DECOR AND PILLOWS!! The sky is the limit here! Bringing in things like pillows and throws, little trays, wall décor, etc. will make all the difference! Adding those different elements all added up to a total room transformation and made a HUGE impact! Most recently, I got those cute buffalo check pillows from my boys for Christmas. (They came from Kirkland’s). I also replaced the Euro Shams with these cable knit ones from Wayfair and I love them so much more than what I had before that always stayed so wrinkled! Mine are the color Gray, but there are several color options to pick from! I really love the silver too! Did this project take some time and money? Yes, it did. But I truly feel it was worth every penny and then some! 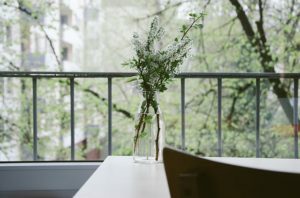 I write this to encourage you that it is ok to decorate for YOU!! So what if the door is closed most of the time and not many people see your bedroom?! YOU SEE IT! Every day and every night. You see your room. If you have it within your means to make some changes, even if you start small and do little bits at a time. Decorate your room for YOU! I promise you will love the feeling of a cozy room at the end of the day. I know I do! Here is a picture of our master bedroom from back in the day! I wish I had more…but back then I didn’t blog so I didn’t take too many pics of it! Can you believe the difference?! « A heartfelt thank you from me to you! It’s beautiful! I love your designs!! Aww, yay!! Thanks so much! Thanks! It’s very different from the last color. May not look it in pictures, but it is! What size is the sign hanging over your wedding picture , so love it , enjoy watching your video’s , you are so talented ! I’m not sure…I would have to measure and let you know. And thank you! Where did you get your Loved you then sign? I absolutely love it! A local girl made it, but she is no longer making signs. Thanks! WOW, so COZY Stacey! You know I will be trying to duplicate what I can. LOVE the sign! Thank you!! I love a cozy space! Hello, curious as to where your wall art above the bed is from. Thank you. Hi! It’s from Kirkland’s a few years ago. Thanks!